Amy Meyer is Chief People Officer for AppFolio. Amy leads AppFolio's human resources functions, partnering with leaders throughout the organization to attract, develop and retain the right people for our growing company. 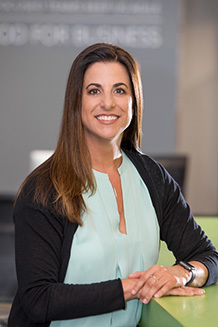 Prior to AppFolio, Amy was the Vice President of Human Resources at Citrix Systems where she was responsible for the company's human resources business partners, talent acquisition, talent management and all HR aspects of mergers and acquisitions. Prior to this role, Amy served as the Vice President of Human Resources, over the product divisions at Citrix, and acted as the Human Resource Director for the Asia Pacific region. Before joining Citrix, Amy was Director of Human Resources at Openwave Systems, serving in several divisional and corporate HR roles. Amy earned a B.S. in Bio-Psychology from the University of California, Santa Barbara and completed the Advanced Human Resources Executive Program at the University of Michigan, Ross School of Business. When not at the office, you can find Amy playing soccer, hiking with her Labrador Retrievers or traveling.